• Contract Faculty: What if negotiations end in a job action? Many of you have been asking questions about the “what happens” if our negotiations end in job-action. Below you will find answers to many of the most-asked questions. Please look this document over carefully and keep it as a reference. If you have any questions, please direct them to Kimberly Ellis-Hale at kimberly@ellis-hale.com. One of the things that keeps employees in our situation up at night is not knowing what happens to them if a strike or lock-out happens. This FAQ should help to alleviate some of your anxieties, as well as prepare you for the steps you will have to take should a job-action occur as a result of a failed negotiations process. Complete the “Job-action Duties Questionnaire” that will be sent to you as soon as a “No Board Report” has been filed. Having all members complete this questionnaire means that everyone will know their role if job-action occurs and that strike benefits will be ready for you within the first week of labour disruption. Provide WLUFA with an alternate email address if you have not already done so. The employer may decide to bar access for members to their WLU accounts and email communications are crucial during job-action. Remove any belongings from campus that you will need/ do not wish to be left behind in case of a labour disruption. Reply to the “Picket Line Pass” email, if applicable. It will be sent if/once a “No Board Report” is filed. This will ensure that WLUFA will arrange protocol language that will allow for certain qualified members to have access to campus, even during a labour disruption. Develop your syllabi for Winter Term (online and in-class) thoughtfully. Know that a “back to work” protocol may require some flexibility in your outline, your assignments and/or your grading. Check your email regularly – you will be informed if negotiations are approaching an impasse and if job-action/ labour disruption seems to be pending. Notice that a strike or lock-out is about to occur will be posted on the WLUFA website and circulated to all WLU email accounts, as well as alternative email addresses (if they have been supplied). Clear instructions will be included. Members will be contacted via email re: strike duties, duty schedule, location for check-in, relevant contact person (depending on duties assigned), locations for restrooms/ first-aid etc. 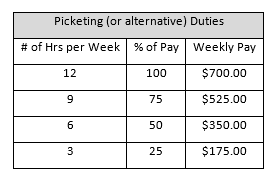 (for picket duty), picket protocol, where/when to collect strike benefits etc. You are required to participate in strike-related duties in order to collect strike benefits. See chart below. Strike benefits are paid accordingly. You should have already indicated your level of involvement and percentage of benefit by completing the “Job-action Duties Questionnaire” by the time that job-action occurs (see note above). If job-action is beginning and you have not yet signed-on for duties, do so immediately by contacting Kimberly Ellis-Hale (kimberly@ellis-hale.com). Important! Please note that, while ALL members of the bargaining unit are welcome to lend a hand during any job action, only those members that are under contract (and, therefore, losing wages during job action) qualify to receive strike benefits. Withhold all duties you have as a Contract Faculty member. There may be some minor exceptions to this – see notes re: the “Picket Line Pass” email (above). Members who are employed in any capacity beyond “Contract Faculty” (as “staff”, for example) are obliged to carry out those duties as per the relevant contract. Participate in your assigned strike duties, as scheduled. Make sure that a designated team leader or captain has signed you in and out of duty-time (this ensures that you will receive your strike benefits accurately and on time). If you are unable to participate in your assigned duties on a given day/time due to extenuating circumstances, please contact Kimberly Ellis-Hale (kimberly@ellis-hale.com) before your assigned shift. Follow the guidelines for a safe and respectful job-action (distributed via email at the beginning of the labour disruption). If necessary, alert your personal financial institutions and creditors to the fact that you are in a labour dispute. Make alternative payment schedules, if possible. If needed, WLUFA will make no-interest emergency loans. Members who would lose more income during the strike than the maximum amount of strike pay they could make for strike duty (i.e. more than $700/week in lost income) are eligible for interest-free loans from WLUFA of an amount not to exceed the difference between the maximum strike pay ($700/week) and the amount which would normally have been received as payment for their contractual obligations to the University during the relevant term. Loans are to be paid back to the Association within one year from the date the loan is made. Members finding themselves in financial difficulty should contact Association Vice-President, Azim Essaji at: aessaji@wlu.ca. Answer blast surveys as sent by the negotiating team. This information helps to move them closer to a negotiated agreement. Attend ratification meeting(s), as necessary. Have your say in accepting/ rejecting your Collective Agreement. The terms of “return to work”, including the financial terms (this includes pension contributions), are negotiated between the bargaining Parties at the end of a labour disruption. The terms of “return to work”, including the financial terms, will be distributed to all members via email. Abide by the Return to Work Protocol, as distributed. If any terms of the Return to Work Protocol pose particular problems or hardships, please contact Sheila McKee-Protopapas (smckeeprotopapas@wlu.ca) and WLUFA will act as an intermediary in finding a reasonable solution. How can I stay informed and get involved? You can check the WLUFA website (www.wlufa.ca), follow WLUFA on Twitter (@WLUFA), or join our official Facebook group (https://www.facebook.com/wlufa). Who should I contact if I have additional questions? If you have additional questions, please contact Kimberly Ellis-Hale (kimberly@ellis-hale.com).